Organisations that empower and give meaning to their members are not only more dignified but also more innovative. Click here to read original article. Early in its history, Southwest Airlines was up against major carriers undercutting it on price and the company knew it had to take some radical steps. After selling one of its four planes just to make payroll, the leadership then asked how it could continue to transport the same number of passengers with fewer planes. The CEO knew he didn’t have all the solutions, so the whole company was put to work. Ideas were sourced from baggage handlers, ground crew, flight crew and even pilots. Based on all of their knowledge of what it takes to turn a plane around at airports, they invented a new way of organising themselves and cut airport turnaround time from 45-60 minutes down to 10. Southwest Airlines continues to involve employees in problem solving and innovation, letting them make decisions on the ground to make sure that customers have a positive experience and operations run smoothly. There is a lot of contact across levels of the firm and rewards and recognition for people who make a difference. The leaders at the top create conditions that enable others in the organisation to take charge. Top management establishes the core values, like customer service and integrity, and then lets employees figure out how best to bring those values to life. Southwest treats its employees with dignity and they in turn treat their customers with respect, making it famous for service. Not only has this made Southwest an attractive career destination, it has also brought it decades of strong profits. The company filed its first $1 billion in annual profit for 2014. Put simply, Southwest’s success can be put down to what I and my colleague Deborah Ancona call distributed leadership. Unfortunately, there aren’t many Southwests out there. But if companies can create meaningful, dignified work environments, they can also create highly innovative and adaptable organisations. And they can do it by distributing leadership. What we often refer to as leadership is the notion of a heroic leader performing miracles from the very top of an organisation. While this can be reassuring, especially at times of uncertainty, this type of leadership cannot be consistently successful in a changing environment – the kind of environment in which just about any organisation and any leader we know now operates in. To be consistently successful, leadership tasks need to be distributed across levels, across functions, across geographies and across individuals to wherever the best information and capabilities reside. But this raises two questions: What capabilities are needed for effective leadership? And how can these capabilities be mobilised to put distributed leadership into action? Our research has identified four such core capabilities for distributed leadership, which we call the “4-CAP model”. The first is “sense-making”, which involves making sense of the context in which the organisation is operating. This should include dialogue and frequent communication up and down the organisation, as well as communication to outside stakeholders to source expertise and new ideas. Connecting and mapping customer demands, cultural norms and competitive challenges is essential to understanding the environment. Second, is “relating”. Leadership is not a solo sport. We lead through many people, so the ability to create trusting relationships with people different from ourselves is part of the relating capability. At the core of relating are two essential behaviours: inquiry and advocacy. To trust and empower the corporate entrepreneurs and mavericks at the front lines, let go of your own perspective and put yourself in their shoes. But inquiry alone is not leadership, so advocacy is inquiry in reverse, letting the other person know what your reasoning, data and understanding is to open the way for dialogue. Third, “visioning” is about creating a compelling picture of the future. While sense-making is about “what is”, “visioning” is about “what is possible”. It is a process of articulating what members of an organisation may be able to create in the future. Steve Jobs was good at explaining that Apple was not just in the business of building computers, but in building a machine that will change the way people think, act, learn and live. Lastly, “inventing” involves developing creative ways to get around roadblocks and keeping the organisation moving as it shifts in new directions. This means creating the structures and processes to move toward the vision outlined in the previous point. It’s important to give people permission to break the rules but at the same time provide them with guardrails. But how many of us have all four capabilities and, more importantly, how many leaders do we know that have all four? Our research suggests that most people are good at one and in exceptional cases, two. Ancona makes the point in this article that it’s time to end the myth of the complete leader, the flawless person at the top who’s got it all figured out. Leaders need others to be complete, which is why they need to rely on teams. These capabilities tend to be distributed across leaders in the organisation. We introduce this model team in our book, X-Teams. 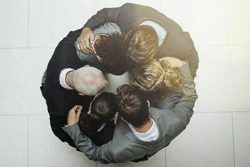 X-teams are the vehicle by which distributed leadership takes place as they enable employees to make connections throughout the organisation and its power structure as well as outside the organisation, hence the “X”, which stands for external action. Throughout our research, we’ve found that high performance teams in today’s organisations “go out” before they “go in”. In my next post I will explain in more depth how X-teams work in practice. Henrik Bresman is an Associate Professor of Organisational Behavior at INSEAD and the Academic Director of both the INSEAD Global Leadership Centre and The HEAD Foundation. He is also co-director of the Management Acceleration Programme, part of INSEAD’s suite of executive education offerings and the co-author of X-Teams: How to Build Teams that Lead, Innovate and Succeed. You can follow him on Twitter at @HenrikBresman.